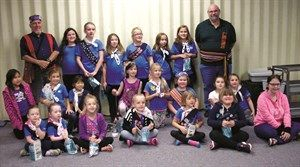 On October 18, 2016, Métis Nation of Ontario (MNO) Veterans’ Council Chair Guy Mandeville, CD, and PCMNO Region 6 Councilor Tom Thompson paid a visit to the 10th Tweed Girl Guides Unit to lead a workshop on Métis history and culture in Ontario. The 10th Tweed Girl Guides are a multi-branch unit with members of all ages from the different branches, which include Sparks, Brownies, Guides, Pathfinders and Rangers. Mandeville and Thompson brought along MNO Métis Education Kits to assist them with their presentation, which Mandeville says was an asset. The youth asked many excellent questions, which both Mandeville and Thompson were more than happy to answer. Overall, the presentation was a very rewarding experience for all involved. 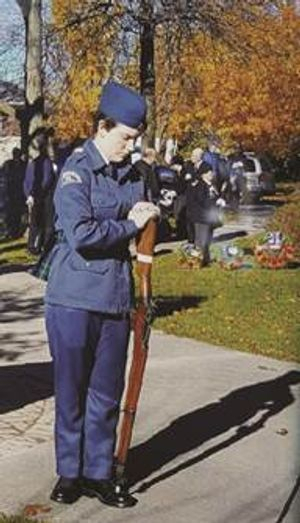 On November 6, 2016, 16-year-old Métis youth Ciara Lannigan took part in a Remembrance Day ceremony held in Tiverton. Since she was in preschool, Ciara has attended Remembrance Day ceremonies with her grandmother Kathleen Lannigan, Métis Nation of Ontario (MNO) citizen and MNO Regional Employment and Training Coordinator, and her parents Shawna Hamilton and MNO citizen Patrick Lannigan. Ciara is a Cadet in Kincardine. Her great grandfather John Lannigan was with the Royal 22nd Regiment during the liberation of Holland during WW II. The family is proud of his service and grateful for his safe return. The family is also very proud of Ciara. 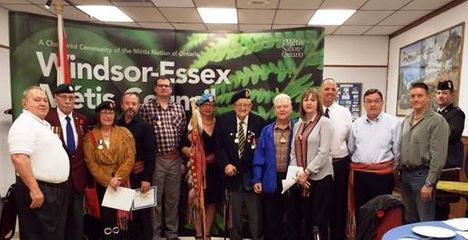 On September 28, 2016, the Métis Nation of Ontario (MNO) Windsor-Essex-Kent Métis Council (WEKMC) presented a certificate of appreciation to Wilfred Rochon, MNO veteran and the MNO WEKMC Councilor, for his dedication and commitment to the Council. Councilor Rochon has been a dedicated volunteer to the Council for a number of years; he was one of the founders of the Council and was a past President. A few weeks later on November 13, 2016, the MNO WEKMC held a Remembrance and Louis Riel Community meeting, where several MNO veterans were presented with Louis Riel medals and certificates. It was decided by the Council that in order to emphasize the Council’s gratitude to Councilor Rochon, they would again present him with the certificate of appreciation during this special meeting. President Froh’s words were very heart felt and appreciated by all. Each MNO veteran received a copy of President Froh’s speech to take home with them. MNO Veterans’ Council President Joseph Paquette next led the presentation of Louis Riel certificates and medals to the following MNO veterans: Sharlene Lance (MNO WEKMC Women’s Representative), Shelly Claus (MNO Veterans’ Council Women’s Representative), Terry Desjardins (MNO WEKMC Chair), Steven Cadotte C.D., (MNO citizen). Recipients who were absent from the meeting include Wayne A. Smith M.B., and William (Bill) Majovsky. As President Paquette handed out the awards, he gave a personal story about each one of the veterans. MNO staff members from the MNO Windsor office hosted a delicious turkey lunch for guests. After lunch, a meeting was called to order. PCMNO Region 9 Councilor Peter Rivers was kept busy with many questions concerning issues and upcoming events for this area. The discussion was great and the pumpkin pie definitely sweetened up the meeting! At the end of meeting, President Paquette was presented with a gift to thank him for making the trip out to Windsor for this special ceremony. President Paquette was left momentarily speechless and was very appreciative at the thought that went into this. The meeting was very well attended with the focus being on the gratitude towards our MNO veterans. On to the next event! (L-R) Jon Rochon (MNO WEKMC Secretary/Treasurer), Wilfred Rochon (MNO veteran and MNO WEKMC Councilor), and Sienna Rochon (granddaughter of Wilfred Rochon). 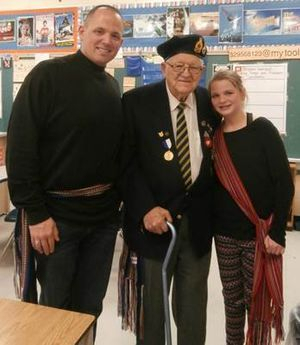 On the heels of Remembrance Day, 90 year old World War II (WWII) veteran and Métis Nation of Ontario (MNO) Windsor-Essex-Kent Métis Council (WEKMC) Councilor Wilfred Rochon gave a presentation to Grade Four students at St. Pius X Catholic Elementary School in Tecumseh on November 21, 2016. Dressed in full regalia, Wilfred shared his personal experience of WWII with the very curious students. Wilfred also talked about his work as one of the founding members of the MNO WEKMC and his role as the Council’s first President. At the end of presentation, he was more than happy to answer the many questions from the class. During his presentation, Wilfred was accompanied by his son Jon Rochon, who is also the MNO WEKMC Secretary/Treasurer, as well as his granddaughter Sienna Rochon. Sienna, who was no doubt very proud of her grandfather and all of his accomplishments, proudly wore her Métis sash to school that day. 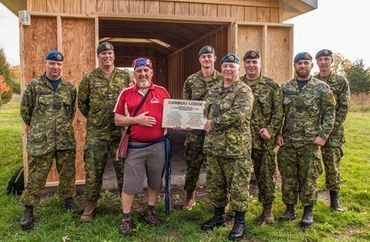 MNO Veterans’ Council Chair Guy Mandeville, CD (third from left) presents Sergeant Euper (fourth from right) from 81 Construction Engineer Flight with a brass plaque commemorating the completion of the Caribou Lodge. (Picture by Corporal Audrey Solomon, 8 Wing Trenton Imaging). On October 18, 2016, Métis Nation of Ontario (MNO) Veterans’ Council Chair Guy Mandeville, CD, was proud to attend the opening ceremony of Caribou Lodge at the Three Sisters Aboriginal Garden in Trenton. The Lodge is a simulated longhouse structure that will provide a place for Indigenous personnel to conduct ceremonies and interact with their cultures. It is located in the Three Sisters Garden behind the Officers’ Mess at the 8 Wing Canadian Forces Base. At the ceremony, Mandeville gave a speech of appreciation for the outstanding work of Sergeant Euper and the entire 81 Construction Engineer Flight (81 CEF) staff. He also presented Sergeant Euper with a commemorative brass plaque to hand at the Lodge. Groundwork on the project began in December 2015 with the laying of a concrete foundation. The Lodge was completed less than a year later on September 8, 2016. Sergeant Euper and the 81 CEF members dedicated many hours of extensive research to understand the significance of a traditional longhouse, and while it wasn’t possible to construct one on the CFB Trenton site, the Caribou Lodge effectively represents many traditional features. The thought and care put into the project is obvious, from the ranch board exterior siding used to make it look rustic to the skylights that were used to simulate the holes that allowed the fire pit smoke to escape. Near the end of the project, the 81 CEF personnel worked many long hours to reach its completion. This included starting their shifts earlier than normal in order to lay the shingles during the cooler hours of the day. MNO citizen Paul Pirie from Fort Frances, a proud member of the Métis Veterans of Ontario, was awarded the Louis Riel medal. He served with the Royal Canadian Artillery and the Canadian Provost Corps ( Canadian Army Primary Reserve ) from 1968 until 1978. Detachment of the 116th Field Battery, Royal Canadian Artillery, prior to that Detachment’s closure. Ex-Lieutenant Pirie is also a recipient of the Queen’s Golden Jubilee Medal, the Canadian Police Exemplary Service Medal, and is a Commander of the Order of St. Stanislaus (Poland). It was a great moment for me! Said Pirie. Every year on November 11, Métis from across the homeland participate in Remembrance Day ceremonies. It is very important for Métis to be a part of these ceremonies because we have contributed to the defence of Canada as far back as the War of 1812 as well as both World Wars, the Korean Conflict, peacekeeping missions and most recently, Afghanistan. Over the years, many Métis have served and many have made the ultimate sacrifice. By making the Métis presence felt at Remembrance Day services, we show our respect for all Veterans and we remind all Canadians of Métis service and sacrifices. Since 2004, the Métis Nation of Ontario (MNO) has laid a wreath at the National War Memorial in Ottawa during National Remembrance Day ceremonies. This year, MNO citizen Richard Lefebvre, C.D., who served in the military for close to 33 years and retired as a Master Warrant Officer, was asked to lay the wreath, with the assistance of his grandson Ethan. Lefebvre says that he is proud to wear his sash on November 11th every year and is happy that the Canadian Armed Forces (CAF) has had regulations in place since 2011 to ensure that Aboriginal members are able to practise their specific Aboriginal customs and traditions, such as the wearing of the Métis sash, with their uniforms. 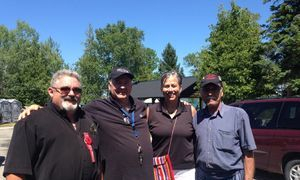 Lefebvre has been an important advocate for Métis Veterans as he has been laying a wreath on behalf of the MNO for the past eight years at the National Military Cemetery at Beechwood in Ottawa during the National Memorial Ride (NMR). The NMR is an annual commemorative event that brings together motorcycle enthusiasts and supporters on the first Sunday of June to remember and commemorate Canada’s Fallen Veterans. This event was started by the National Memorial Riders and was taken over by the Royal Canadian Legion. Lefebvre’s group is the only motorcycle group allowed in Beechwood cemetery. Sergeant-at-arms) at the “Every Child Matters” walk. This past September, Métis Nation of Ontario (MNO) Veterans’ Council Sergeant-at-Arms Rob Baskey, participated in Northern College’s Every Child Matters walk. 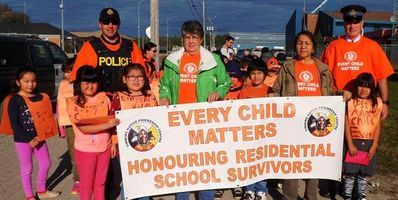 During the walk, participants were encouraged to wear orange shirts to commemorate and remember those impacted by residential schools. The walk was co-sponsored by the Timmins Native Friendship Centre (Moosonee Site). The keynote speaker at the walk was residential school survivor Elder Rachel Chakasim. Rachel’s daughter Sharon Ross, who is the Site Manager at the Timmins Native Friendship Centre, also attended the walk. Both Rachel and Sharon made very emotional testimonies on the impact residential schools had on their family. Every year September 30th is declared Orange Shirt Day; in recognition of the harm the residential school system did to children's sense of self-esteem and well-being. Orange Shirt Day grew out of Phyllis (Jack) Webstad’s story of having her shiny new orange shirt taken away on her first day at a residential school. The Métis Nation of Ontario (MNO) Veterans’ Council received a great honour at this year’s AGA in North Bay when they were each presented with an Eagle feather. The feathers were a gift by the MNO Veterans’ Council newest representative, Shelly Claus, who serves as Women’s Representative. Claus chose to present the Council with this special distinction to recognize their many accomplishments over the last four-year term. In particular, she wished to recognize their unwavering commitment to honour and acknowledge Métis veterans and their passing of the torch of remembrance to Métis youth. 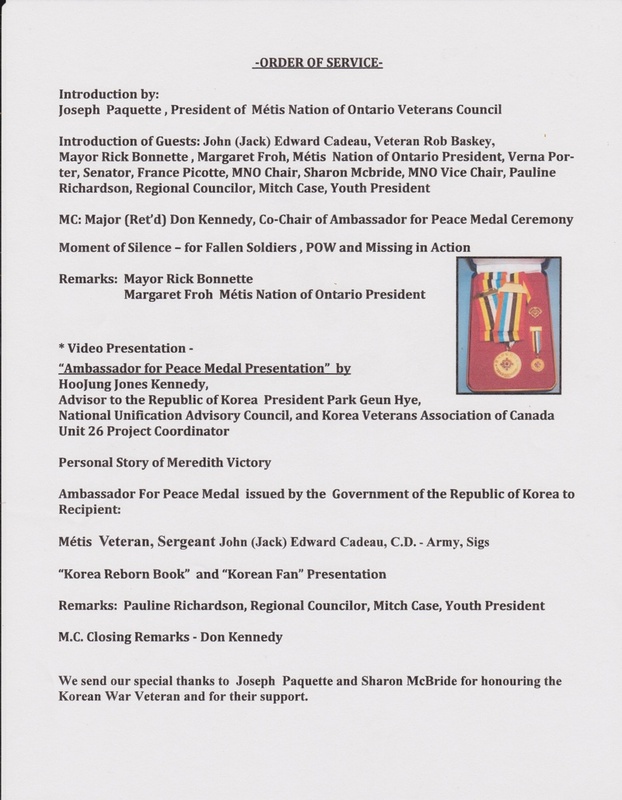 A few of the Council’s recent accomplishments include: the publishing of the MNO veterans book—Fighting For Canada Before There Was A Canada, Ontario Métis Veterans Pass the Torch; their attendance at the Welland Museum grand opening with 105 year old Métis veteran Alex Boucher; the presentation of the Korean Ambassador for Peace Medal to Métis veteran Jack Cadeau; the 100th anniversary of Vimy Ridge project and many more! 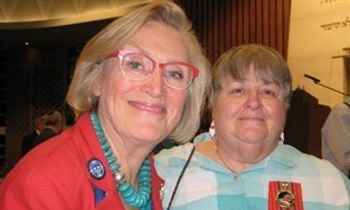 On 15 Oct 16 Dorothy Eastman and Cynthia Forrest both received their Louis Riel medals and certificates from Yvonne Jensen the President of the MNO North Channel Métis Council. They are pictured with their sister June Smart who is currently the Women's Rep for the North Channel Métis Council. Thank you Joseph for taking care of all the administrative requirements in order to have the medals presented to my sisters. Three sisters that served..................Congrats to all. Information provided by MNO Veteran June Smart. 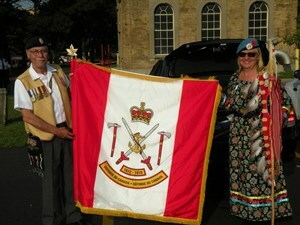 (L-R) Joseph Paquette (MNO Veterans’ Council President), Her Honour Elizabeth Dowdeswell, O.C., O.Ont. (Lieutenant Governor of Ontario), Dr. Alis Kennedy, O.Ont., C.D., O.M.C. (MNO Veterans’ Council Senator), and Guy Mandeville, C.D. (MNO Veterans’ Council Chair). On October 5, 2016, the Métis Nation of Ontario (MNO) Veterans’ Council met with the Honourable Elizabeth Dowdeswell, O.C., O.Ont., Lieutenant Governor of Ontario. This special meeting was arranged by Joanne Meyer, MNO Director of Intergovernmental Affairs. After a brief interview was completed, a copy of the MNO Veterans’ book—Fighting For Canada Before There Was A Canada: Ontario Métis Veterans Pass the Torch was presented to Her Honour in acknowledgement of her support of the book. Her Honour had graciously provided a letter of endorsement, which was published in the MNO veterans’ book in August 2015. MNO Veterans’ Council representatives met with Dave Levac, MPP for Brant and Official Speaker of the Legislature of Ontario. A presentation of the MNO Veterans’ book was made in recognition of his support of the Veterans’ book. He provided a formal letter of endorsement witch was published in the Veterans’ book in 2015. Following the presentation, we were all invited to join him for lunch in the “Speakers Suite”. This was quite an honour. Many conversations took place over lunch witch also included the positive impact the MNOVC has made and will continue to make. We also found out that we were all related through certain families going back in the 1600’s. This proved to be very exciting. Over the past year fundraising for the Métis Veterans Vimy 100th Anniversary celebrations in Ottawa have been going strong. Veteran’s Shelly Claus and Sharlene Lance have been busy organizing various events throughout 2015-2016. Significant funds have been raised with all proceeds going to the MNOVC Vimy Ottawa project. Some of the fun events included a steak dinner, raffle tickets, and two loonie/toonie auctions. On a side note over 100 people attended the streak dinner, we sold out of tickets for the raffle prizes and approximately 85 people attended each auction, said Shelly. Thank you to all the citizens, friends and family that bought tickets and donated prizes and cash. A big thank you is in order to all the volunteers for their help at these events. Your support of our Veterans is greatly appreciated. Many thanks go out to Veterans Shelly and Sharlene for their fund-raising initiatives. 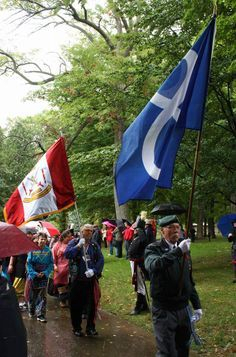 MNO Niagara Regional Métis Council President Derrick Pont carrying the 1812 banner and MNOVC President Joseph Paquette carrying the Métis flag. On October 2nd, 2016, the MNOVC had representation at the Landscape of Nations’ inaugural unveiling and dedication of the Six Nations and Native Allies Commemorative Memorial event held at Queenston Heights. This event commemorated the Six Nations peoples and their Native Allies who participated in the war of 1812. The Métis were recognized as being their allies and participated by flying the Métis flag and their 1812 banner as part of the Veterans’ Honour Guard. Such pride in people’s hearts! Michelle-Elise Burnett (Suzanne Rochon Burnett’s daughter) and Brian Kon from the MNO Niagara Regional Métis Council participated in the various committees which resulted in the Métis inclusion. Many thanks go out to all the organizers and volunteers that saw this great project to fruition. The Métis Nation of Ontario (MNO) Veterans’ Council have started a campaign to recognize the efforts of MNO Community Councils to support the Vimy Ridge project. Métis veterans and youth will attend the 2017 Vimy Ridge remembrance service taking place in Ottawa to mark the 100th anniversary of this important historical event. The MNO Georgian Bay Métis Council (GBMC) have always been a great supporter of the MNO Veterans’ Council and its initiatives, including: programs with youth and the first-ever MNO Veterans’ book. The MNO GBMC also presented the MNO Veterans’ Council with a decorated canoe paddle at their Annual General Meeting in 2012. The paddle was designed as part of a project that brought Métis youth and elders together and included Danielle Callander, MNO GBMC Secretary. On September 6, 2016, Dr. Alis Kennedy, O.Ont., C.D., O.M.C., Métis Nation of Ontario (MNO) Veterans’ Council Senator, was invited to attend an event at a Toronto Synagogue. 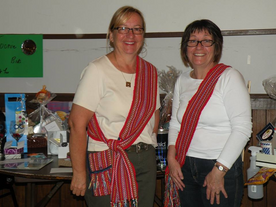 Senator Kennedy proudly displayed her Métis pride at the event by wearing a Métis sash pin. Upon hearing that the Honourable Carolyn Bennett, Minister of Indigenous and Northern Affairs, would be in attendance, Senator Kennedy decided to bring three copies of the MNO Veterans’ book—Fighting For Canada Before There Was A Canada, Ontario Métis Veterans Pass the Torch. On July 23, 2016, the Métis Nation of Ontario (MNO) Veterans’ Council attended the MNO Great Lakes Métis Council's (GLMC) 7th Annual Fish Fry in Owen Sound. The event was held on a beautiful day at the Hibou Conservation Area Park and included great food, people and entertainment. This annual event provided the opportunity for Greg Garratt, MNO Veterans’ Council Secretary and Region 7 Captain of the Hunt, and Joseph Paquette, MNO Veterans’ Council President, to meet the new MNO President Margaret Froh for the first time. The MNO Veterans’ Council would like to thank the MNO GLMC and all the volunteers that helped make this event such a success. “We are grateful for this opportunity to attend this great event and meet so many wonderful people,” said President Paquette. banner at the Warriors' Day Parade. On August 20, 2016, for the first time in 95 years, the Métis Nation of Ontario (MNO) Veterans’ Council had a recognized contingent in the Warriors' Day Parade (WDP) at the Canadian National Exhibition in Toronto. The MNO Veterans’ Council were very excited to participate in the parade, as the MNO Annual General Assembly usually takes place on the same weekend. However they ran into a slight problem, as in order to march in the parade as a contingent, a minimum of five members must be present and the MNO Veterans’ Council unfortunately only had three MNO veterans available that weekend. Thankfully, the President of the WDP Council waived the minimum member requirement and allowed MNO Veterans’ Council citizens—Joe Paquette, President; Shelly Claus, Women’s Representative; and, Dr. Alis Kennedy, O.Ont., C.D., O.M.C., Senator and a member of the WDP Council, to march in the parade. The WDP marked the first time the MNO Veterans’ Council were ever publicly acknowledged as a bona fide contingent. The MNO Veterans’ Council proudly marched in the Honour section of the parade while carrying the MNO 1812 banner, an Eagle staff and the National Métis flag. The Council stood out by their buckskin vest, ribbon dress and ribbon shirt. The WDP was also the first time that the MNO 1812 banner and the National Métis flag were flown in a public event involving the MNO Veterans’ Council. The parade was very well attended and included the Honourable Elizabeth Dowdeswell, O.C., O.Ont., Lieutenant Governor of Ontario and Honorary Patron of The WDP Council as well as Vice-Admiral Mark Norman, M.A.G., C.M.M., C.D., Vice Chief of the Defence Staff as the 2016 Warrior’s Day Parade Reviewing Officer. Dr. Darrell Menard is a Métis Nation of Ontario (MNO) citizen and Veteran who is about to embark on a very exciting adventure. 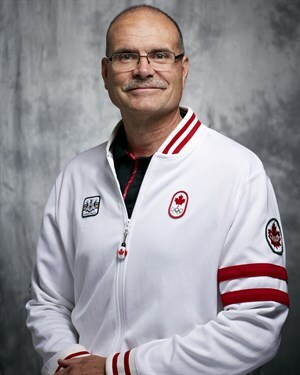 Dr. Menard is one of the core Team Canada physicians for the 2016 Paralympic Games in Rio de Janeiro. The application process to join the team was very competitive and involved a lengthy selection process against other qualified medical personnel. At the 2016 Paralympic Games, Dr. Menard is one of four Team Canada volunteer physicians. He has been assigned the track and field team, but will likely work with other teams prior to arriving in Rio. Team physicians complete medical and medication reviews for all of their assigned athletes prior to the Games. While at the Games, they are responsible for providing sideline coverage during practices and games. They are also responsible for running a Canadian Team medical clinic at the Paralympic village. Dr. Menard has worked at over 20 major games including the 2015 Parapan Am Games, the 2014 North American Indigenous Games, the 2013 Military World Football Cup and the 2012 Olympic Games. Dr. Menard graduated from the University of Alberta in 1976 with an Honours Degree in Physical Education and then began a 40-year career in the Canadian Forces. In 1981, he completed a Master of Arts Degree in Exercise Physiology at the University of Alberta. He graduated from the medical program at Queen’s University in 1988. Dr. Menard completed his flight surgeon training in 1991 and in 1992 he opened a family/sport medicine practice in Russell, Ontario. In 1994, he completed his Canadian Academy of Sport and Exercise Medicine Diploma. Dr. Menard is currently a family physician with a specialty in sport medicine. He retired from the Canadian Forces after 40 years of service in both the regular and reserve forces and continues to work as the Surgeon General’s Specialist Advisor in Sport Medicine. Dr. Menard also teaches Musculoskeletal Examination Skills at the University of Ottawa, Queen’s University and the Northern Ontario University programs. Dr. Menard is a great Métis success story and role model. Good luck in Rio Dr. Menard! Police Deputy Chief Ron Gignac C.D., a MNO Veteran who enjoys the great outdoors shares his love of fishing by participating in the Belleville Fishing Derby. 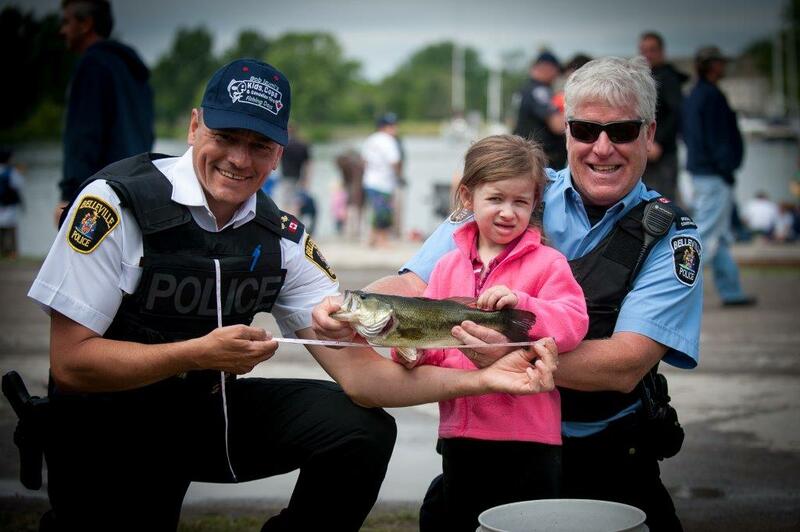 Here is a photo of our successful annual cops and kids fishing derby here in Belleville. Of course, yours truly is measuring the fish of one of our young people along with Special Constable Mark Chapelle. We had an enormous number of kids, parents, grandparents, guardians, at our derby this year last weekend. We had a blast fishing with the kids. For many, it was their first fish ever caught. We catch and release at the derby and the excitement on the young people's faces during this event was truly inspiring. Hundreds of kids attended and much of our Service volunteers including our auxiliary, CP volunteers, special Constables, family members of our officers and staff and many more. The MNR had a superb display set up as did our local fire service. Our community business sector and private donors contributed prizes, food, fishing gear, funding to purchase a host of great prizes and so much more- We are certainly blessed in Belleville to have such fine citizens, business owners, and community volunteers. The Métis Nation of Ontario (MNO) was well represented at the event. The Provisional Council of the Métis Nation of Ontario (PCMNO) Chair France Picotte brought greetings on behalf of the MNO. MNO Summer Youth Cultural Program (SYCP) facilitators were also present at the event and set up a booth where attendees could learn more about Métis history and culture. MNO Georgian Bay Métis Council President David Dusome and MNO Region 7 Captain of the Hunt Greg Garratt were also in attendance. “Prior to Canada becoming a nation, a new Aboriginal people emerged out of the relations of Native women and European men. The initial offspring of these unions were individuals of mixed ancestry who resulted in the beginning of a new Aboriginal people with a distinct identity and culture in west central North America — the Métis Nation. On August 1, 1615, French explorer Samuel de Champlain arrived on the shores of Georgian Bay in the region of what is now Penetanguishene. 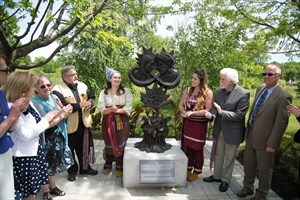 Rotary Champlain Wendat Park commemorates Champlain's visit to the region. The park's Legacy Walkway features six statues portraying individuals and peoples significant to the history of Ontario and Canada. Three provincial plaques located at the park share the story of Champlain's sojourn in Ontario in 1615, told in English, French, Anishinabe, Montagnais-Innu, Mohawk and Wendat. A companion provincial plaque was unveiled at Champlain's point of departure from France, in Honfleur, last October. "The 400th Commemoration was a unique opportunity to recognize the significant contributions of our founding peoples to making Ontario the diverse and dynamic province of today,” said Madeleine Meilleur, former Minister Responsible for Francophone Affairs. “Ontario is pleased to offer these plaques to the Town and residents of Penetanguishene in the revitalized Rotary Champlain Wendat Park. This is an important legacy of the 400th and a tribute to the key role played by First Nations, Métis and Francophones in our province's development." General (Retired) Walter Natynczyk CMM, MSC, CD, and MNO Veteran Don Kennedy CD. I had the honour of receiving an invitation to accompany one of our MNO Veteran’s to his presentation of the Minister of Veterans Affairs Commendation. What a great honour indeed. Don is a Major (Retired) Canadian Armed Forces (CAF) Reserves soldier with over 43 years of service. A dedicated community volunteer and a contributor to many local and national organizations including the Métis Nation of Ontario Veterans’ Council and the MNO Clear Waters Métis Council, he is a strong advocate for Aboriginal people and Veterans. Mr. Kennedy was instrumental in organizing the military component for the opening of the Canadian Warplane Heritage Museum. In 2012, he was Registration Committee Chair of the Hamilton Light Infantry 150th Anniversary, a 3-day event which included the “Trooping of the Colour” for HRH, The Prince Edward, Earl of Wessex. 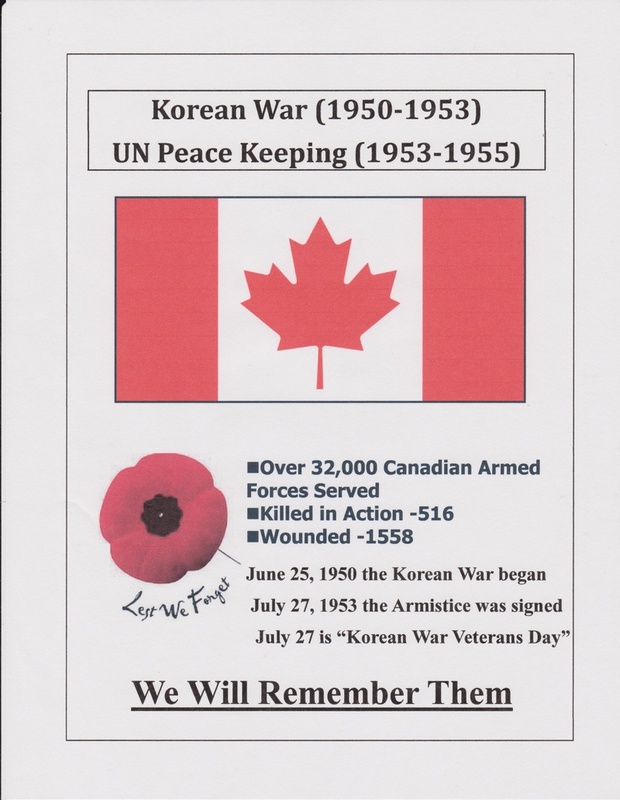 Mr. Kennedy was one of the Korean Veterans Association (KVA) Unit 26 Republic of South Korea (ROK) Memorial Project Committee members which raised funds to erect the RCN Ships in Korea Monument in Burlington, ON. 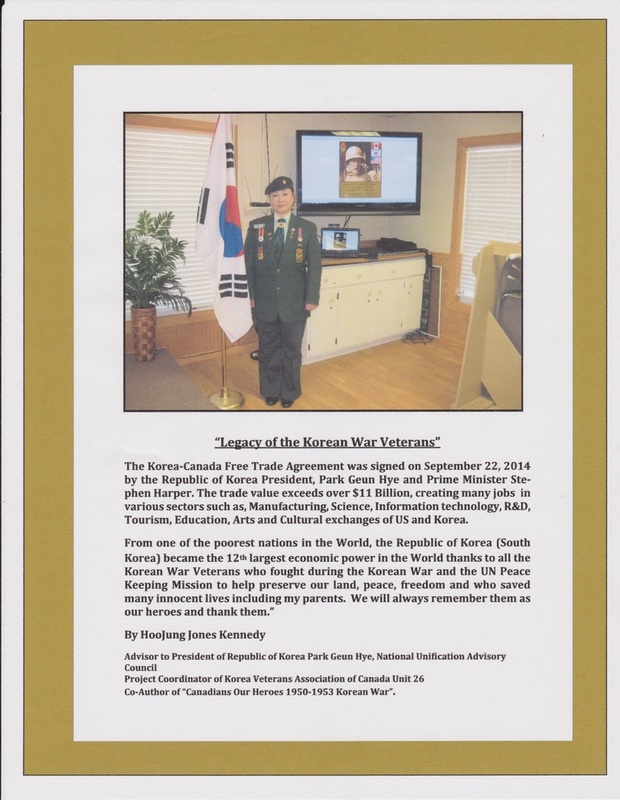 He was involved as a committee member in numerous Veterans Affairs Canada events to celebrate “The Year of the Korean War Veteran” and “The Year of Korea” in 2013. He was inducted as an Honourary Korean War Veteran by the KVA for his advocacy. He received The 31 Canadian Brigade Group Commander’s Commendation in 2006, the Royal Hamilton Light Infantry Commanding Officer’s Commendation in 2007, and the Commanding Officer’s Commendation for 2008. In 2012, Don was awarded the Queen’s Elizabeth II Diamond Jubilee Medal. Congratulations to MNO Veteran Don Kennedy C.D. CFB Borden Base Commander Colonel Doyon J.B.C., C.D.and Lt. Col. M. Richardson from the Lincoln and Welland Regiment Commanding Officer for 3CRPG. On May 26th, 2016, CFB Borden hosted the Aboriginal Veterans’ Day. As part of the day’s activities, the MNOVC presented the Veterans’ book to the Base Commander Colonel Doyon J.B.C., C.D., and to and Lt. Col. M. Richardson from the Lincoln and Welland Regiment, Commanding Officer for 3CRPG. Many thanks for the organizing and hosting of this great event honouring our Aboriginal Veterans. 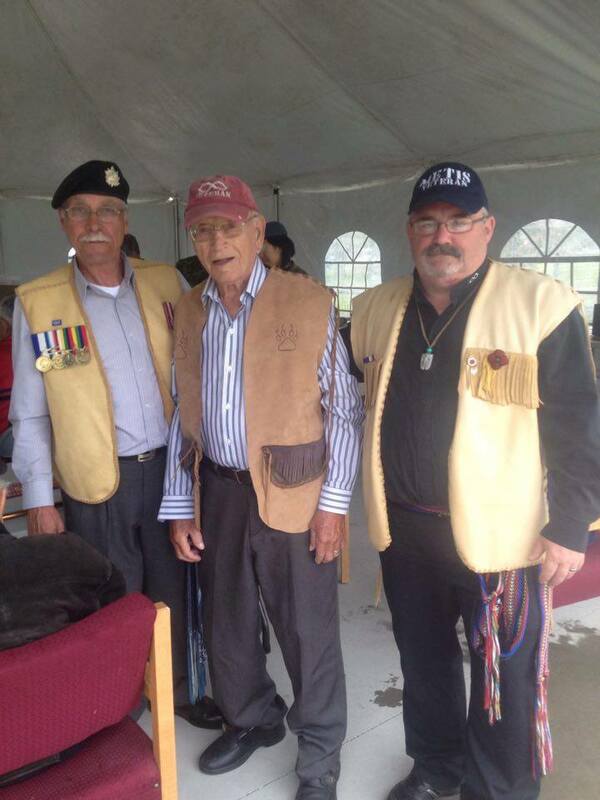 (L-R) MNO Veterans’ Council President Joseph Paquette, MNO veteran Alexander Boucher and MNO Veterans’ Council Secretary Greg Garratt. On May 26, 2016, at the Canadian Forces Base Borden, the day was full of surprises for 103-year-old Métis Nation of Ontario (MNO) certified veteran Alexander (Alex) Boucher. Accompanied by his daughter Carol Boucher and son Eugene Boucher, Alex attended the Aboriginal Veterans’ Day event. The surprise of the day came when Alex was presented with his first leather vest. This presentation was arranged by MNO Veterans’ Council Secretary Greg Garrett. Alex was so thrilled and wore the leather vest with great pride. Leather is an important commodity for Métis culture. Early Métis clothing was frequently made from leather and decorated with beads or quills (Métis Legacy II, 2006). Hunting and the traditional art of hide tanning continue to be important skills for the Métis. Although it rained, it did not put a damper on the day’s activities. The MNO Veterans’ Council was well represented along with the MNO Summer Youth Cultural Program youth who jigged and danced for guests. 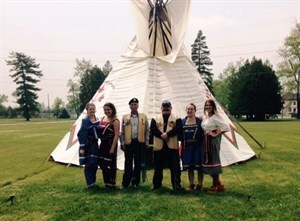 On May 26, 2016, at the Borden Military Base, Métis Nation of Ontario (MNO) Summer Youth Cultural Program (SYCP) facilitators participated the Base‘s Aboriginal Awareness Day event. SYCP facilitators performed Métis jigging and taught some of their favourite dances to the attendees. They also provided children's art programming such as dot art and finger-weaving. Despite the rain, everyone had a great time they and were very grateful for the opportunity to meet with MNO veterans including MNO Veterans’ Council President Joseph Paquette and Secretary Greg Garratt. 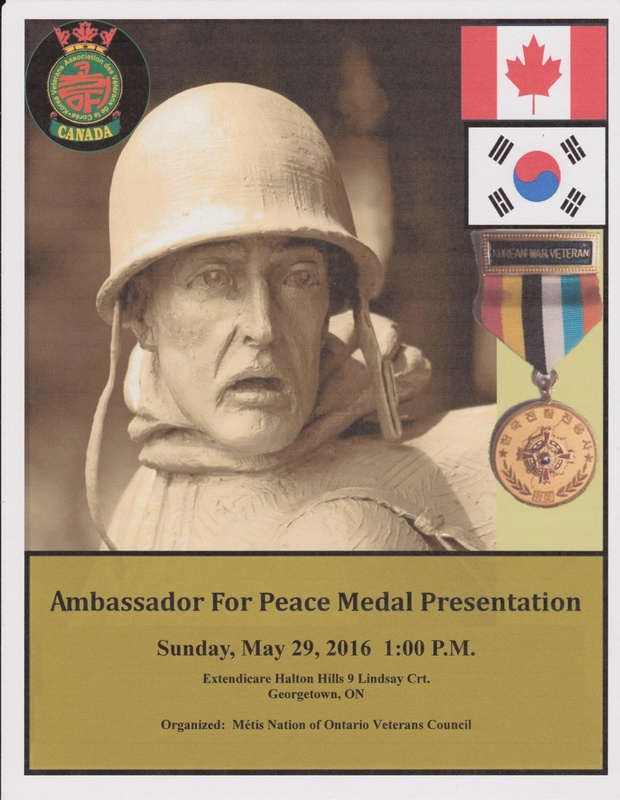 C.D displays the Korean book and proudly wears the Korean "Ambassador For Peace Medal". 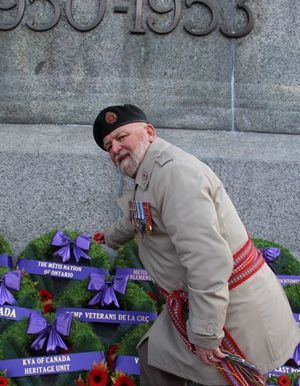 Métis Nation of Ontario (MNO) veteran Sergeant John (Jack) Edward Cadeau C.D. grew up in Port Severn, Ontario. When the Korean War broke out, he felt the need to serve his country and in April 1951, at the age of 17, he joined the army. 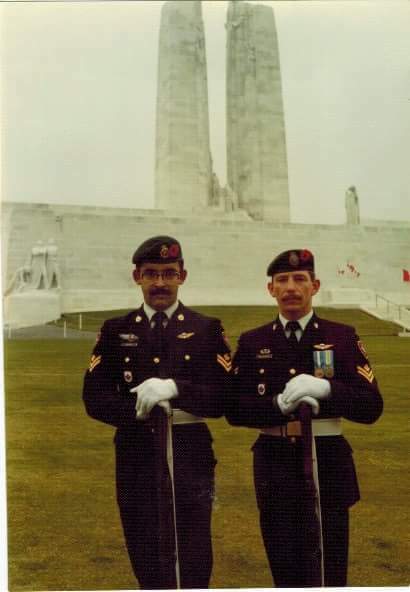 Sergeant Cadeau spent 25 years in the service and retired in June 1975. Sergeant Cadeau was recently awarded two prestigious awards in recognition of his military service. The second award was presented on May 29, 2016, when MNO Veterans’ Council President Joseph Paquette, MNO Chair Sharon McBride—who is Sergeant Cadeau’s daughter—and her family, paid a surprise trip to Georgetown for the Ambassador for Peace Medal Presentation. Also present at the ceremony were the following PCMNO members: Chair France Picotte, Region 7 Councillor Pauline Richardson, Senator Verna Porter-Brunelle, Youth Representative Mitch Case and Post-Secondary Representative Katelyn Lacroix. Sergeant Cadeau was awarded the Korean Ambassador for Peace Medal, which was presented by HooJung Jones Kennedy, Advisor to the Republic of Korea President Park Geun Hye, National Unification Advisory Council, and Korea Veterans Association of Canada Unit 26 Project Coordinator. This commemorative medal is an expression of appreciation from the Korean government to Canadian service men and women who served in the Korean War. On February 14, 2016, MNO Veteran John (Jack) Cadeau C.D., a Korean veteran, was presented the Louis Riel Certificate. In a surprise visit to Georgetown by MNO Veterans’ Council President Joseph Paquette and MNO Chair Sharon McBride and her family, the planned event was a great success. Jack was very surprised indeed. Jack is ‘one’ of the two MNO verified Korean Veterans. Come and support the Métis and First Nations Veterans. This is another opportunity to showcase our Métis Veterans. Come and join us ! MNO Niagara Region Métis Council President Derrick Pont (left) and MNO Veterans’ Council President Joe Paquette (far right) presents the MNO Veterans’ Council book to Welland Museum curator Penny Morningstar (middle). On May 6, 2016, the Welland Museum launched the Niagara and the Great Wars exhibit, which looks back at the impact of both world wars on the community and pays homage to Métis and First Nations involvement in both of the 20th century’s great wars. Prior to the launch, Métis Nation of Ontario (MNO) Veterans’ Council President Joe Paquette and MNO Niagara Region Métis Council (NRMC) President Derrick Pont were invited to participate in the creation of this exhibit, providing the museum with their expertise on Métis involvement in the Great Wars. The exhibit also features a plethora of artifacts, uniforms and medals from a local private collection, together with the MNO Veterans’ Council, MNO NRMC, First Nations - Brantford, Royal Canadian Legion Br. 4, Welland and Royal Canadian Legion Branch 613, Fonthill. The Ontario Canadian World War One Commemoration Foundation-funded exhibit—with contributions from the Welland and Pelham Legions, the MNO NRMC, First Nations Brantford and the Ward Family Collection—was the brainchild of Cameron Ward, who is named as the exhibit's guest curator. Welland Museum Acting Executive Director Penny Morningstar notes the exhibit is particularly special in that it will be presented not only in English and French but also in the Métis language of Michif and in Mohawk. “For us at the museum it was really important,” said Morningstar, explaining it is a unique chance to share those languages as they struggle against fading away. “People can come in and see the written word,” she said. Seen as an important pre-cursor to the Vimy Ridge Commemorations in Ottawa in 2017, the MNO Veterans’ Council is very appreciative for this incredible opportunity, which was initiated by President Pont. The MNO Veterans’ Council encourages as many people as possible to attend the exhibit and support this fantastic initiative. The museum is open Tuesday to Saturday, 10 a.m. to 4 p.m. and on Thursdays from 1- a.m. to 8 p.m. For more information about this exhibit, please visit the Welland Museum. Also visit the Photos tab to the left. On March 30th, a meeting was held at the Welland museum. An invitation was given to the MNO Veterans’ Council to participate in the “Niagara and the Great Wars” exhibit. The meeting, arranged by Derrick Pont and Penny Morningstar, went very well and was followed by a presentation of the Veterans’ book to the Welland Museum. 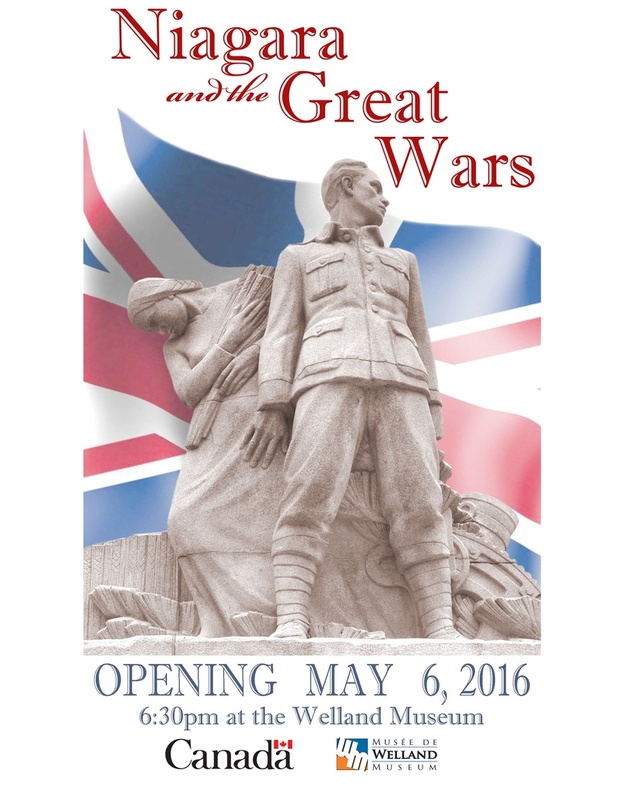 The “Great Wars” exhibit will run from May 6th (launch) to December 2016. This is seen as a great opportunity to showcase some of our WWI and WWII veterans. The MNO Veterans’ Council encourages as many MNO citizens as possible to attend the exhibit and support this fantastic initiative. Seen as an important step to the Vimy Ridge Commemorations in Ottawa 2017, the MNO Veterans’ Council is very appreciative of this incredible opportunity which was initiated by Derrick. April 9, 2017 will mark the 100th year commemoration of the battle of Vimy Ridge. During the First World War, more than 15,000 Canadians fought at Vimy Ridge and claimed victory. However, this victory came at a high cost: 3,598 Canadians were killed and another 7,000 wounded (Statistics taken from the Canada War Museum.) This important battle was a defining moment for Canada. We Shall Remember Them. The MNO Veterans’ Council plan to commemorate the Battle of Vimy Ridge in Ottawa next year. For more information, please visit the MNO Veterans’ Council Vimy Ridge Project page. Our hearts were saddened by the passing of Veteran Earl Ralph Scofield (Boots) from the MNO Windsor Essex Métis Council. His passing occurred just before Remembrance Day. MNOVC provided a wreath. Due to not meeting the number criteria from the Tours company, the MNOVC had to change the location from Vimy Ridge, France, to Vimy Commemorations in Ottawa, our nation’s capital. Plans are in progress to secure transportation, accommodations and such in order to secure our place in the Commemorations. The fund-raising is ongoing and will be utilized to make the Ottawa Commemorations a great event. The nominal roll started in 2012 with 22 verified Veterans and now sits at 73 verified Veterans for 2016, including those that have passed since 2012 (WE SHALL REMEMBER THEM) . This is an increase of over 230% since 2012. I would like to thank the MNO Veterans’ Council for believing in making a positive difference, working together through many challenges and raising the bar. The Moss Park Armory in Toronto. It was with great sorrow that Métis Nation of Ontario (MNO) Veterans’ Council President Joe Paquette attended the military service conducted for his friend and regimental Sgt. 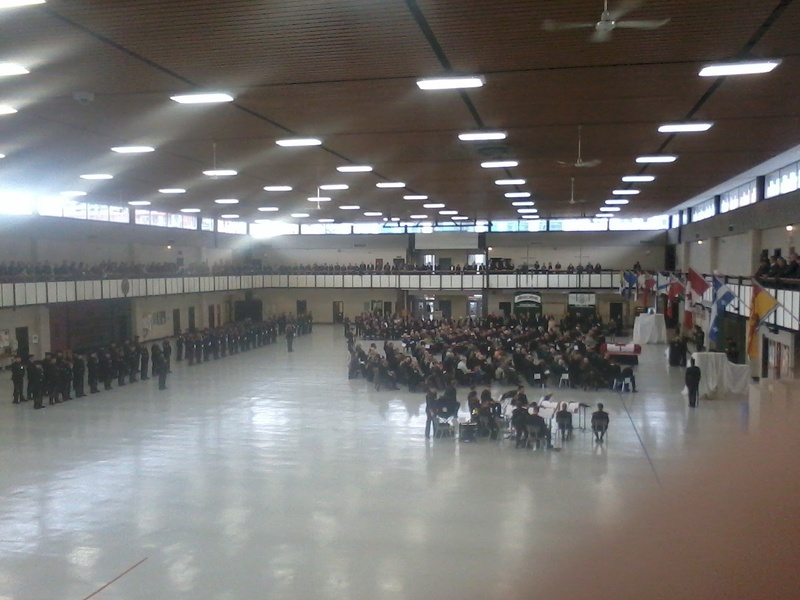 Maj. Scott “Paddy” Paterson, CD, held on February 20 at the Moss Park Armory in Toronto. Paterson served in the Queen’s Own Rifles of Canada, an infantry regiment of the Canadian Forces Reserve and the only militia unit in Canada with a parachute tasking, and Paquette served in the Queen’s Own regular forces, 1st Battalion. The two had known each other since the days when Paterson was still a corporal. During the service, Paquette was able to march with the Queen’s Own Rifles’ Parent Association. As the only Métis present, Paquette’s sash gave rise to many questions and much interest from other attendees. It gave him an excellent opportunity to inform people of the Métis who have served and who currently serve in the Canadian Armed Forces in the defense of Canada. Paquette, and MNO Veterans’ Council Treasurer Chris Plummer. During the 2015 Annual General Assembly (AGA), the Métis Nation of Ontario (MNO) Veterans’ Council set up their very first booth and silent auction in an effort to raise funds for the Vimy Project and for the veterans’ community. Linda Plummer and her son, MNO citizen Liam Plummer, ran the MNO Veterans’ Council booth during the AGA. The booth was a great responsibility that required many hours of setting up, overseeing, recording sales and tearing down once the AGA ended. Linda and Liam’s diligence and patience contributed to the success of the booth and silent auction. Following the AGA, the MNO Veterans’ Council presented Linda and Liam with Certificates of Appreciation for their support and a job well done. Chris Plummer, Liam’s father, accepted the certificate on his behalf as he was unable to attend. Resource Centre at Loyalist College. 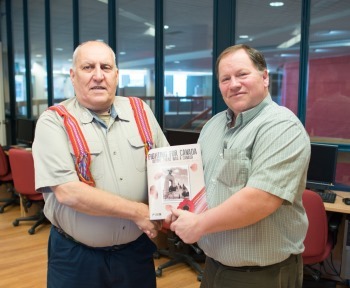 Loyalist College became the first post-secondary institution to be presented with a copy of Fighting for Canada Before There Was A Canada, the book produced by the Métis Nation of Ontario (MNO) Veterans’ Council. On January 13, MNO Veterans’ Council Chair Guy Mandeville visited the Aboriginal Resource Centre at Loyalist College and presented a copy of the book to Paul Latchford, the Manager of the Aboriginal Resource Centre. 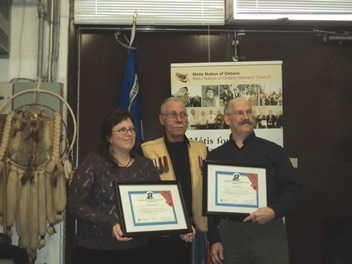 Latchford congratulated the MNO Veterans’ Council on its efforts to share stories from Métis veterans. “All of this information is accessible, but this group has taken the initiative to bring it together. This book is a wonderful resource for Loyalist faculty, staff and students,” he said. Fighting For Canada Before There Was A Canada is a compilation of stories contributed by Métis veterans, their families or friends, detailing the veterans’ experiences in combat and non-combat roles. 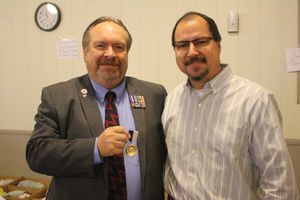 On December 11, Métis Nation of Ontario (MNO) Veterans’ Council Chair Guy Mandeville, CD, received the Canadian Forces Logistics Branch Postal Coin for his continuous assistance and participation within the Canadian Forces Postal Service. Since his retirement, Mandeville continued to be a knowledgeable source of postal history for new clerks and officers who have just joined the Postal Service. Mandeville remains informed on the history of the postal trade and hosts presentations on the subject. Mandeville is currently assistant curator of the historical display kept within the Canadian Forces Postal Unit at Canadian Forces Base (CFB) Trenton. In 2012, he was instrumental in assisting the Postal Service to trace their postal history in the War of 1812. The Postal Service became the only non-fighting unit to receive the War of 1812 banner, a banner presented to units of the Canadian Forces tracing military lineage to that point in history. Mandeville continues to be a welcomed member of the postal family and is often invited to make guest presentations during apprentice and officer courses on military postal history.